I have very little experience with Cryx. I have a very basic understanding of what they do, mostly from reading a few cards, and listening to other people talk about them. And from what i've heard, the Skarre's can be pretty bad. 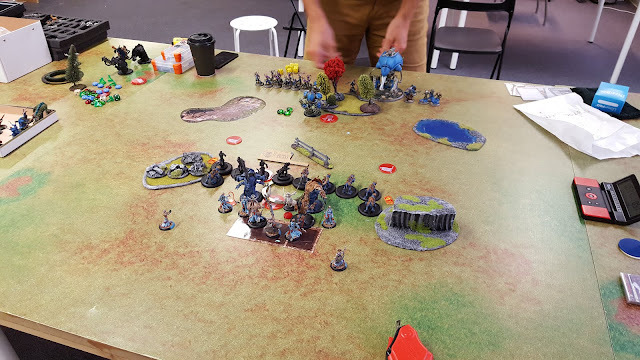 So when i got the chance to play one of the few local Cryx players i jumped right at it. Before i start. I'm still waiting for my second Willbreaker and Ferox unit to arrive in the mail, so in most reports for now i will use a few proxies. Soulward steps in as Willbreaker, while some proxybases with Bloodrunners on top substitutes as Ferox. Looking at his list, i can see that he really only have two elements that really threatens me, that being his two big Jacks. The damage output on these two can be pretty insane. Luckily for me, i outthreat him by a mile! and he have absolutely nothing to stop tough or Stay Death. Her Feat can be a real pain, but my own can negate it pretty well. The Scenario was Extraction. I won the roll off, and decided to go first. I pretty much allways want that with this list, as it's ability to put real pressure T1 is pretty incredible. I went for a pretty standard central deployment, not much to say about it really. My opponent placed Skarre behind the forest next to the Kraken on his left while the Raiders kept to the right. Deathjack deployed centrally next to his objective. I run everything up, taking care to be just barelly outside DJ's threatrange. 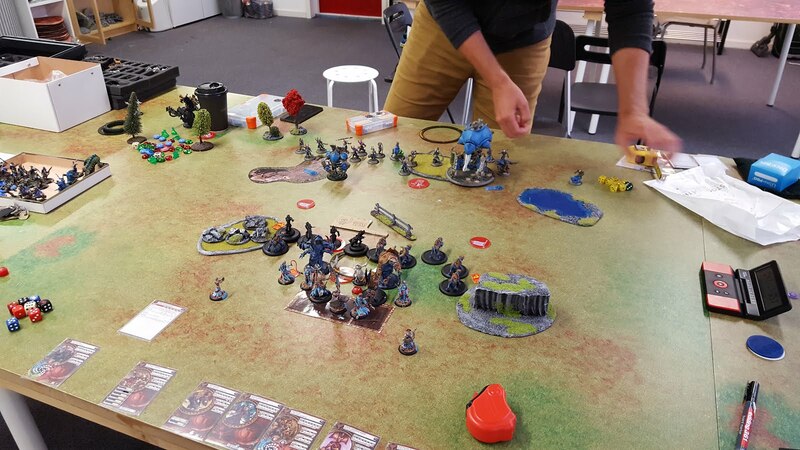 Because of his positioning of the Kraken my plan is to try and eventually Skew left where the fence in the middle can help a lot with keeping him away from the left flag, allowing me to score pretty safelly as long as i can remove DJ and Raiders. Because of how incredibly fast the list is it can be pretty easy to hide my intentions as i can quickly move from one side to the other. He moves a little forward, very careful about my threats. DJ shifts to the left while kraken moves up a little and tries to land an AOE on the right Ferox unit. The shot scatters and does absolutelly nothing, but one cat gets to move a little bit closer due to dodge, meaning that he have to be a little bit more carefull with Skarre and the solos, a Single cat can still be a pretty bad thing in the middle of your lines. Death ward on the Kraken and Admonition goes up on DJ. Looking at how he's positioned i'm pretty sure he will try to jam and feat next turn. He's still a little bit too far away for me to fully commit, as the Forx alone can't reliably do too much to his heavies, and spreading out too much can be a real pain. I see no reason to push and instead just shuffle a bit. Makeda moves up a tiny bit and camps everything for Stay Death Purposes. I position my left Ferox so that if he wants to commit with Deathjack he can only get one cat. The Gladiator positions himself a bit outside of the 3" mark from DJ's probable landing spot for Charge/Slam purposes. The right flank takes care to stay outside of Kraken's threat with everyone exept one to try and lure him into a position where i can block him behind the fence. 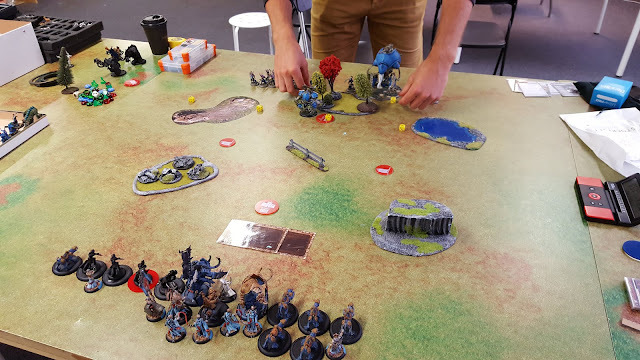 I make a bit of a brainfart as i forget to rile the warbeasts, leaving them both on zero fury, meaning that i will have to cut myself for everything i need the following turn, and i expect to use Stay Death a lot. Being the noob that i am i forgot to take a picture after his turn, sorry.. He takes both baits. Kraken moves up and tries to kill the one Ferox he can reach, but to no avail. 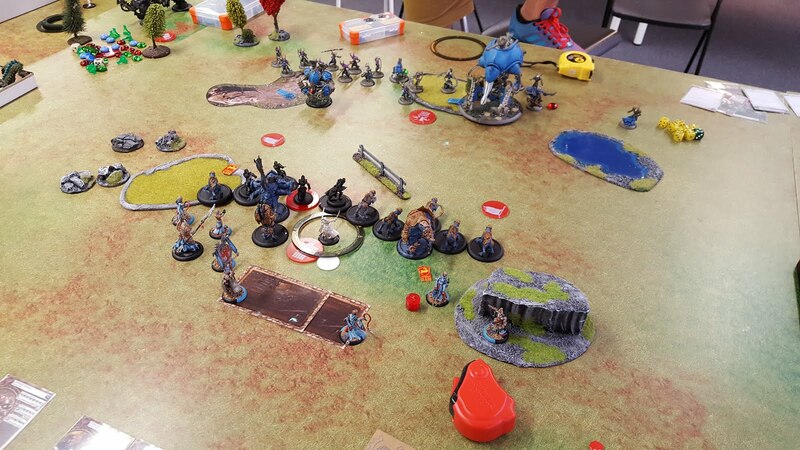 DJ is loaded with 5 focus and charges, barelly killing the cat on his last attack. Raiders move up to jam with the solo moving in to score as i had to let him get that opportunito to deny DJ too many targets. Skarre feats on herself, DJ and Kraken and moves up behind it. I think he arcs Black Spot onto the Right Ferox unit as well. My turn, and DEF 18 Deathjack with admonition is a thing. I know i want to clear it away together with as many raiders i can get my hands on to consolidate my hold on the left flank. Managing to actually hit it might be a problem though, and with admonition it can move away, unless i manage to block it. Makeda activates, Feats and moves as far towards the flag as i can manage.The left Ferox unit activates. Not moving at all, but jumping to avoid triggering Admonition. They clear out the jamming raiders, then use reposition to box the DJ in. A willbreaker gives the Gladiator Puppet Master, and the Glad Slams ahead, knocking DJ down. Radheim charges in to finish the job. The other Ferox unit runs in behind the Fence, two of them contesting the right flag. 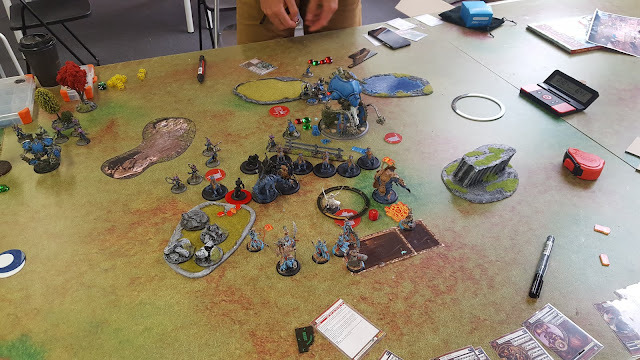 Not having much of a choice, Kraken tries to move in to kill the Black Spotted Ferox behind the fence, but i start rolling toughs, and Stay Death takes care of the rest. Even leaving me with enough fury to save all but one of the left unit of Ferox who doesn't have tough due to their designated Willbreaker giving Puppet master to the Gladiator instead. Due to the fact that he's pretty much locked in place with the kraken, and my ability to trivially remove all his fast elements we agree that it's no point to continue. There's no way he can get to Makeda for an assassination, and i can lock the Kraken down with Ferox, letting me set up for a combined charge with both beasts to kill it. Therefore he concedes. Looking back, i believe my Pre game thoughts about this match up still stands. no ways to stop me from using Stay Death, and without any real ways to threaten me on assassination or lock me out of scenario, this is bordering unplayable for the Cryx player. One way or the other i will destroy at least one of his heavy hitters before he can land a severe blow to me, and one of them alone simply isn't enough.The fact that my feat somewhat negates his doesn't help him one bit.Still it's an interesting start to a long day of playing.